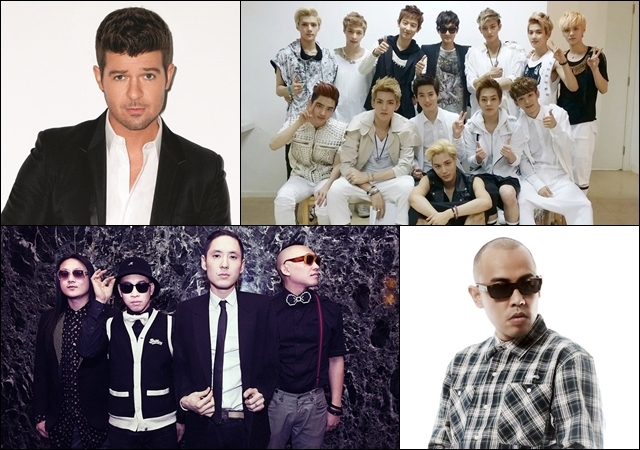 K-pop boy band EXO will perform at the MTV World Stage Live in Malaysia 2013. EXO has been added to the line-up of performers which currently includes Robin Thicke, Far East Movement and Joe Flizzow, according to MTV Asia. The MTV World Stage Live in Malaysia 2013 will be held at the Surf Beach at Sunway Lagoon on Sept. 8 with an expected turnout of about 15,000 fans. This will be EXO's first performance in Malaysia and on MTV. The 12-member boy band debuted last year. EXO released their first full-length album "XOXO" last June, which has topped Billboard's World Albums chart, and has sold more than 300,000 copies. They will release the repackaged version of the album on Aug. 5 containing three new songs including the title track "Growl." EXO won the 2013 Asia Popular Group Award in the Asian Idol Awards in China. The group also performed in the ceremony held last July 28. On the other hand, Thicke has written and produced songs on more than 20 gold and platinum albums including Michael Jackson, Pink and Christina Aguilera. His new single, "Blurred Lines," from his latest album "Blurred," has topped Billboard's Hot 100 chart and continues to dominate the chart. It climbed to the No. 1 spot on iTunes in 80 countries and has been downloaded 1.5 million times. Far East Movement made history in 2010 with their platinum-selling "Like a G6." Its members are Kev Nish, Prohgress, J-Splif, and DJ Virman, who grew up in Los Angeles. The group is currently working on their fifth album and they just released their new song "Illest" featuring Riff Raff earlier this month. Flizzow is one of Asia's hottest hip hop stars. Since the release of his English album, "The President," in 2009, Flizzow has performed across the world, including Australia, U.K. and Asia. At last year's MTV World Stage Live In Malaysia 2012, about 18,000 fans attended the event featuring Justin Bieber, K-pop sensations Jay Park and Kara, and Malaysia’s Mizz Nina .